Insert-Mold Decoration (IMD) is the process of inserting a graphic overlay into an injection mold. The graphic "floats" between two layers of injected plastic. This method of decoration ensures that the graphic will not wear off over time with constant use. Refurb Supplies uses this method when molding our replacement face plates for several models of hand-held business phones. This replacement faceplate is compatible with Spectralink's 6020 mobile office phone. Our replacement blue lens will fit the OEM housing perfectly. The 3M adhesive will keep it in place. The silver film in the in-mold decoration of this lens is compatible with the Polycom hand-held office phone. 3M adhesive creates a strong bond to the OEM housing. 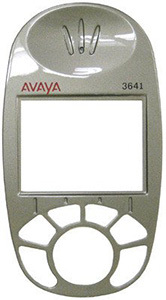 Repair the front face lens of your Avaya 3641 mobile office phone with this compatible replacement lens. We use 3M adhesive to ensure a strong bond to the housing.